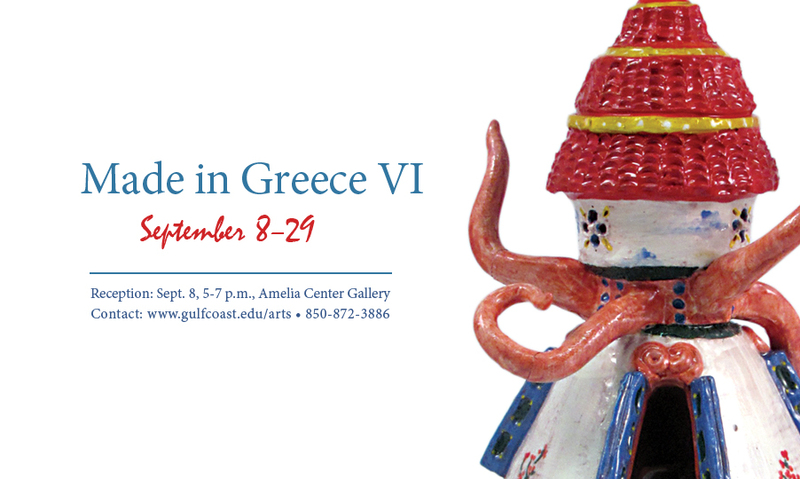 Panama City, FL – The Visual & Performing Arts Division of Gulf Coast State College presents “Made in Greece VI,” an exhibit featuring artwork produced by students and faculty of the Athens/Skopelos Study Abroad Program. The work in the show was produced over a three-week period at The Skopelos Foundation for the Arts, in Skopelos, Greece. After completing intensive ceramic and photography courses at Gulf Coast, the students traveled to Greece where they created artwork in response to the rich artistic and cultural traditions of the country, the island of Skopelos and their personal experience as travelers. The resulting work offers a glimpse into the unique experience of each student. Featured artists are Pavel Amromin, Aaron Bailey, Brianna Bennett, Corey Casey, Karla Contreras, Wendell Gibson, Tammy Marinuzzi, Jennifer Robinson and Wade Rubin. The exhibit will be on display in the Amelia Center Main Gallery (Room 112) September 8 through September 29 with the opening reception to September 22nd 5pm-7pm. Gallery hours are Monday through Thursday, from 10:00 a.m. – 7:00 p.m., and Friday 10:00 a.m. – 4:00 p.m. This entry was posted on September 9, 2017 by 850music in Posts and tagged press release.